You know those foods that you taste once and then you simply can’t get it out of your mind? 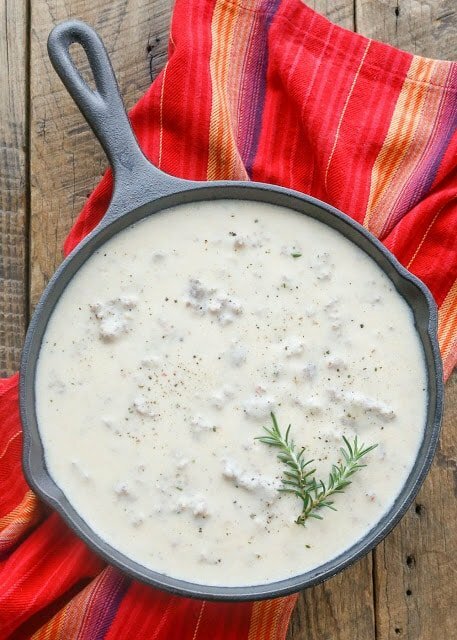 This Sausage Gravy is one of those foods. You’ll find yourself remembering it (and craving it again!) at all hours of the day. The hints of fragrant rosemary add something unforgettable and after just one bite, many people have told me this immediately became their all-time favorite gravy. 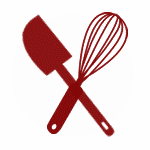 Would you like the secret behind making the best sausage gravy you’ll ever taste? It’s that little sprinkling of rosemary. 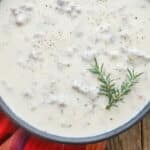 A few years, after tasting a rosemary sausage gravy at a restaurant, I started adding rosemary to my gravy when I made it. That little addition takes a simple old-fashioned recipe for biscuits and gravy from being something that we enjoy eating to the level of being something that I crave on a regular basis. 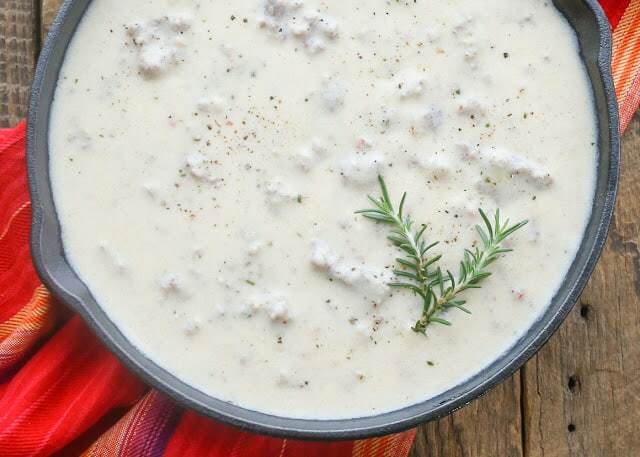 This rich, creamy sausage gravy recipe is the heart of one of my favorite “brinners” – breakfasts that we eat for dinner; although this gravy is always a hit for breakfast as well. Sometimes we dunk toast sticks into the gravy or pour the gravy over hot biscuits. Sausage Gravy is also heavenly over hash browns with an egg on top. 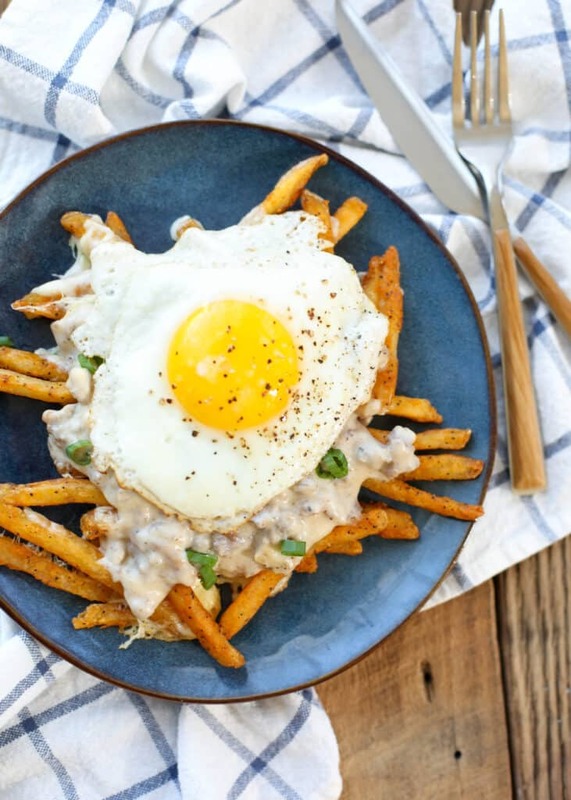 My youngest son’s favorite breakfast for dinner is this Breakfast Poutine: crisp, hot fries and melting cheese curds topped with sausage gravy and a fried egg. What’s not to love? For the past year or two, my favorite way to serve sausage gravy is over savory waffles. My infatuation with savory waffles started with the Ham and Cheddar Waffles I shared a couple years ago. In the time since then, they’ve become a regular on our breakfast and dinner table and I keep them in the freezer as well. If you haven’t yet tried them, you’re missing out. 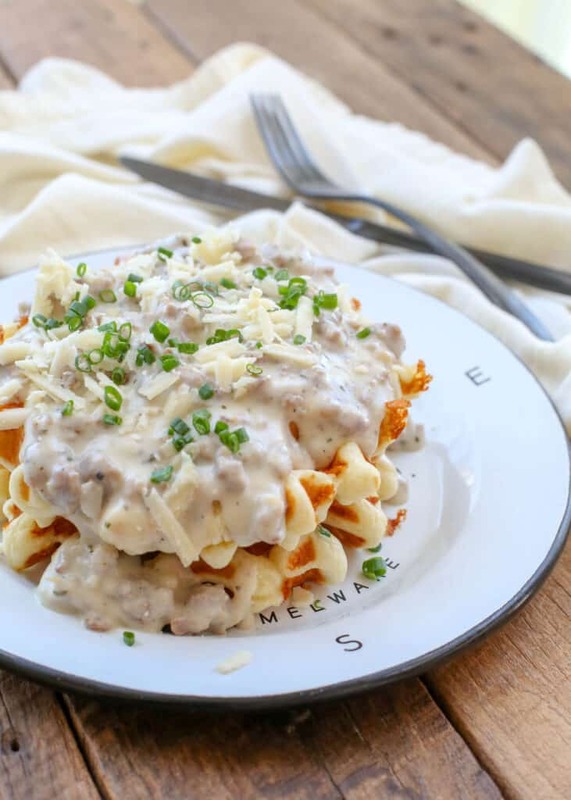 Cheddar and Chive Waffles with Sausage Gravy is a new favorite breakfast, but this gravy is delicious over classic Buttermilk Waffles as well. I’ll even admit that I’ve been known to eat this gravy with a spoon, it really is that good. Making a truly excellent sausage gravy is easier than you might think. Start with a sausage that you like. I typically use a country or breakfast sausage. Crumble the sausage as it starts to cook in a large skillet. Once it has browned, sprinkle with flour and toss well to coat. Add the milk, salt, and pepper. Let the gravy cook and thicken for about five minutes, while you stir frequently. Add the rosemary, taste the thickened gravy, and add additional salt and pepper only if needed. Cook an additional minute or two and remove from the heat. The gravy will thicken slightly as it rests. Serve hot. Kitchen Tip: I use this skillet to make this recipe. The hints of fragrant rosemary add something unforgettable after just one bite. In a large skillet, over medium high heat, cook the sausage, crumbling the meat as it browns. Sprinkle the flour over the sausage and stir to coat. Add the milk, salt, and pepper. Stir while bringing to a simmer and continue cooking for about 5 minutes while the gravy thickens. Add the rosemary. Stir and taste the gravy, adjust salt and pepper as desired. Remove from the heat and serve immediately over warm biscuits. Enjoy! Season the gravy lightly with salt and then taste it, adding more salt, 1/4 or a 1/2 teaspoon at a time, until the gravy tastes right. The amount of salt you need depends on the type of sausage that you use. Some breakfast sausages are heavily seasoned with salt and pepper and others are very lightly salted. Gravy requires a good bit of salt to bring out all of the flavor. Classic breakfast sausage should require about 1/2 teaspoon of salt, the “all natural” sausage varieties I’ve used with this recipe require about 1 1/2 teaspoons of salt. You know how much I LOVE this recipe! Oh wow, does that ever look good, and thanks for the shout-out! Oh this is our favorite Christmas morning splurge! Love a good gravy but haven't tried it with rosemary. Wanted to stop by and wish you a very, very Merry Christmas Mary! Where is a biscuit when I need one? 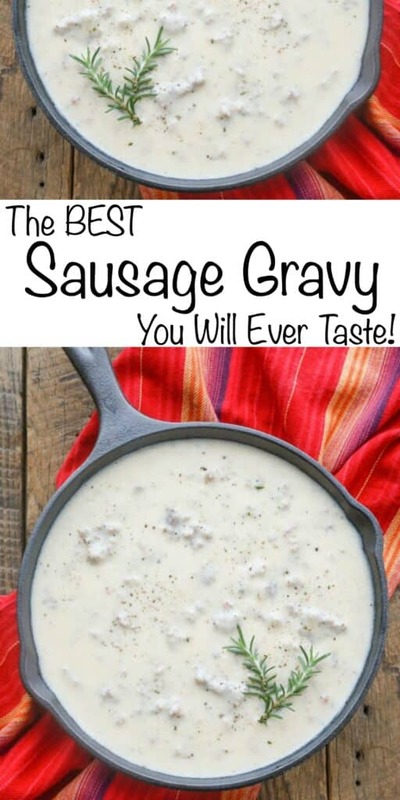 Great sounding recipe, sausage gravy is a guilty pleasure of mine. i have been wanting a good goof free sausage gravy and here it is on barefeet in the kitchen. The taste is wonderful and pleasant. The rosemary makes it so fresh tasting. Thank you for it. I love nutmeg in gravy as well. Isn't it fun how many ways there are to make it, Phyllis?